Found at a church bazaar, today's Catch o' the Day : (I crack me up) An Old Original Bookbinder's Lobster bib. Linen, I think. 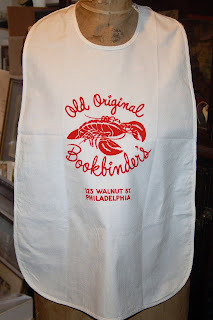 Just because you can never have too many lobster bibs just kickin' around.